If you’re a fan of nail polish and use it for yourself at home or at work, then you know just how difficult it can be to keep all your polishes organized. There are endless colors to collect and as you build up your nail polish stock, storing the small bottles becomes harder and harder. Rather than leaving them loose or trying to contain them within a bag or drawer, you should think about investing in a piece of equipment dedicated to the storage of your nail polish. You can add an acrylic nail polish organizer to your collection. When it comes to organizing your nail polish collection, there is nothing better than having all your polishes in one place. You will be able to locate them easily and won’t need to worry about losing your favorite shade. Keeping your polishes all in one area isn’t the only benefit of using an organizer, however. Keep stock of what polishes you have and which need to be replaced. Display your polishes so you can see all your colors. Organize your polished by categories such as color of finish. While these things may seem simple, once you have your polishes thoroughly organized, your painting process will be much easier. Are you planning to display your polishes for others to see, or do you simply want them organized but stored away? How big is your nail polish collection? Do you plan to add more polishes to your collection? Will you need your polished to be easily portable for work or leisure? What sizes and shapes are your nail polish bottles? When you consider the answers to these questions in relation to your nail polish collection, you will be able to identify what you need in an organizer. The idea is to choose an organizer that will accommodate all the nail polishes in your collection and leave room for more, if you plan on expanding. Another route you could take when creating a setup for your nail polishes is building a DIY nail polish organizer. This would allow you to customize the storage system, while also considering the place it will be kept. The Home-in Nail Polish Holder is a super affordable option that is ideal for storing your polishes at home. 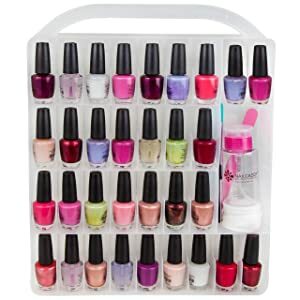 This organizer holds up to 60 polishes and is made with heavy duty clear acrylic. The holder is organized into 5 rows for a compact look. If you are a professional, you could use this holder to present popular colors on your counter. 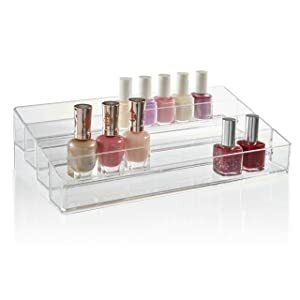 If you have a mix of different nail polish brands, then you will appreciate the Home-it holder, as it is made with spacious rows that will accommodate most polish bottles. This holder is sturdy and reliable and provides you with the flexibility to change the position of your polish collection at any time. If you have a large collection, invest in a few of these holders and decorate your space! The Makartt Organizer is an ideal option for amateurs and professionals who take their polish on the go. 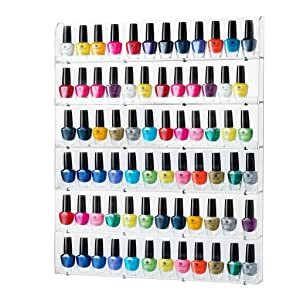 This box organizer holds up to 48 nail polishes and is designed to be used for most brands of polish. You can get creative with how you store your polishes and tools in this organizer case, as it has an adjustable divider. The box is made with a secure snap latch to ensure that your polishes are safe and stay in place when you transport them. The box opens from both sides, so that you can clearly see all of your polishes displayed to make choosing a color quick and easy. The clear container means that you can look at your polishes and decide on a color before you’ve even opened the case! 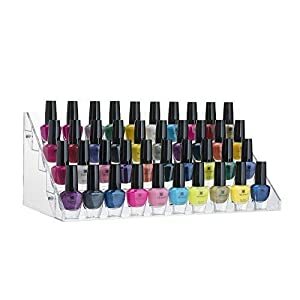 The STORi organizer is another very affordable option that can help you build a larger collection and setup of polishes. Each individual rack holds up to 40 polishes and is designed with 4 stepped tiers. The durable holder is designed to fit most brands of polish and can also be used to store your nail tools. Whether you have a small home collection or want to add extra organizers in your professional setting, the STORi rack will suit your needs. The acrylic stand is compact, making it a great option for small spaces or the need to transport polishes from area to area. The Saganizer Organizer Rack is a bigger investment in your nail polish storage, but will provide you with a stable place to display your colors. This rack is meant to be wall-mounted and stores up to 102 polishes at a time. The rack is designed with six rows, so it is compact yet efficient for storage. The rack is made of sturdy and high quality acrylic and comes already assembled. This rack is a great option for adding more display space in your professional nail setting, or simply adding a cosmetic touch to your home. The rack is designed to hold bottles of different shapes and sizes. Keep in mind that the sizes and shapes of your polish bottles will influence how many you can store! The Nail Caddy Organizer is another reliable option for anyone who needs to carry their polishes on the go. This organizer box holds up to 64 nail polish bottles. It is designed to be universal and will work for most polish brands. The box is clear and allows you to see each color displayed even when it is closed. The sturdy handle and safety latch making transporting this organizer easy. Nail Caddy has your convenience in mind and provides you with a refillable nail polish remover bottle which has its own compartment in the organizer. There’s no need to worry about accidentally breaking any of your polishes, as this organizer will not tip over! Maintaining a serious collection of nail polish for personal or professional use can get complicated if you don’t have a structured storage system. Invest in a nail polish organizer to simply and enhance your nail painting experience!